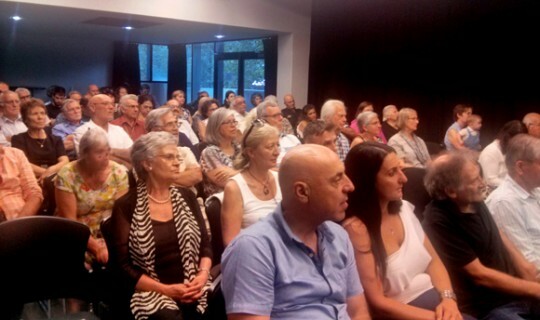 The Greek Community of Melbourne (GCM) recently paid tribute to Nikos Koundouros by screening his multi- awarded film The Ogre of Athens – The Dragon. The event took place last Sunday evening at the mezzanine floor of the Community's Cultural Centre. 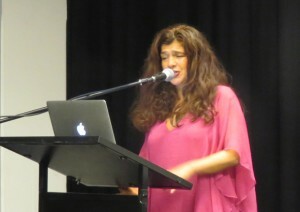 Poet Andrea Demetriou spoke at the event as she knew Koundouros personally. Addressing a full house, Theo Markos, Vice President of the GCM, introduced Andrea Â to the audience by referring to her book of poems ‘The mountains couldn’t walk away’, which was launched in 2010, by Tim Colebatch, economics editor of The Age at the time; Arnold Zable- author who were amongst the audience, as well as author Christos Tsiolkas. The book refers to the Turkish invasion of Cyprus, as seen through the eyes of a child. Theo Markos also mentioned that Andrea had interviewed and befriended the collaborators of the movie who unfortunately are no longer with us. Andrea described the film as a masterpiece and a landmark in Greek cinema. She compared it to The Birds by Aristophanes, directed by Karolos Koun, which was the highest moment in Greek theatre and was awarded the prize of nations in Paris in 1961. She also spoke about Manos Hatzidakis, Koundouros’ closest friend and collaborator, who wrote the music of the film as well as the music for Koun’s performance of The Birds. She stated that in her opinion Hatzidakis is the best Greek composer of 20th century Greece. She referred to the three collaborators, Koundouros, Hatzidakis and Kabanelis who wrote the scenario, as the three Magi, and concluded by saying that this is what happens when great artists join forces. Andrea surprised everyone by asking Arnold Zable to speak about his beloved writer, Iakovos Kabanelis whom, she introduced to Zable in Athens back in 1997. This well attended unique event was honoured by the presence of multi awarded, journalist Tim Colebatch, awarded author Arnold Zable, Roger Wilson who was secretary of the Seaman’s Union and advisor to Minister of Labour Steve Crabb, unionist- writer George Zangalis, Â journalist Rena Frangioudaki from 3XY, journalist Vivienne Morris from Neos Kosmos, journalist Panos Apostolou from SBS and Â the Antipodes Festival co-chair person Leo Vlahakis.